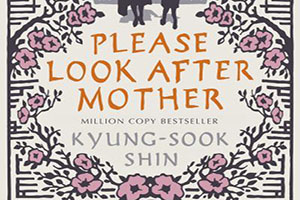 Please Look After Mother should include the subtitle ‘otherwise you will die of guilt. This is South Korean writer Kyung-suk Shin first novel translated into English. It recently won the Man Asia Booker Prize apparently because it illustrates life in modern South Korea. I don’t know if I necessarily got this sense of life there. Mom and Dad live in a village and go to visit their kids in big city Seoul. At the train station, Dad loses Mom and Mom goes missing. The novel is a series of first person narrations by three of the kids (it is never explained why we don’t get to hear from the fourth) as well as Dad as they try to find Mom. Each is subsumed by guilt for not taking better care of Mom when she was around. Mom’s voice also makes an appearance and her section is the most powerful of the novel. In fact this novel seemed less to me about how modern Koreans live than about how many sacrifices a Mom like Mom makes for her kids. It is a touching story and familiar in that most kids do not mollycoddle Mom the way Mom did them, but then are kids supposed to? Yes, this novel says, for kids Mom should be # 1. The thing is this novel demands that Mom’s sacrifices be repaid whether the kids asked for them to be made or not. Please Look After Mom not only demands you be uber-nice to your mother–always— but beats you over the head with a guilt trip if you should feel otherwise. Is Mom a good mother? Is Mom an over protective and emotionally domineering mother? Should Mom have developed her own sense of worth in order to expect others, in this case, her own kids to respect her? Am I being ridiculously callous and unsentimental to even raise such questions? If nothing else this is a story which asks where the change occurs from one generation trembling before their parents and another eyeing their parents with disdain and for this alone is worth a read.